GUEST BLOG—By Tiffany Misrahi, World Economic Forum--In 2016, the travel and tourism industry contributed an astonishing $7.6 trillion to the global economy – that’s 10.2% of global GDP. It also generated a total of 292 million jobs, which means that 1 in 10 people work in the sector. The numbers of international arrivals are just as impressive, reaching 1.2 billion in 2016, 46 million more than in 2015. What’s even more incredible is that these figures are expected to continue growing in the coming decade. And this has the potential to help countries generate economic growth, create jobs and enable national and regional development. These countries have successfully created an enabling environment for travel and tourism to thrive by facilitating travel to their nation, promoting their natural and cultural heritage, and ensuring rewarding and hopefully unforgettable experience for their visitors. Unfortunately, there is no magic bullet and no one-size fits all approach that other countries not in this top 10 list can attempt to copy. Some countries will have more difficulty growing their tourism industry as a result of their economic or geopolitical context, while others may not have been blessed with unique natural and cultural resources. That said, this year’s report shows that many countries around the world have been able to make policy changes that have made them more competitive. And from those observations, we’ve been able to draw together four interesting points that all countries might learn from. While historically the majority of travel was North-North, this reality is changing. Outbound travel from Africa, the Middle East and Asia-Pacific is expected to grow exponentially in the coming decade. Developing and emerging markets are not only becoming larger source markets, but they are also improving their travel and tourism competitiveness in order to position themselves as more attractive destinations. 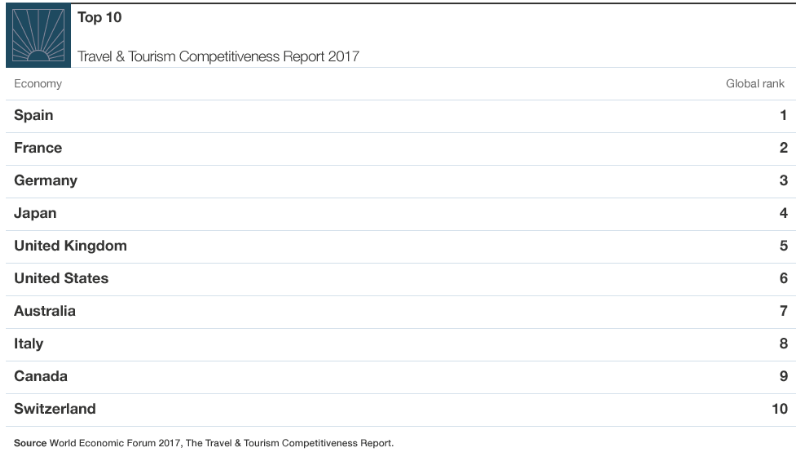 In the 2017 edition of the Travel & Tourism Competitiveness Report, we found that 12 of the top 15 most improved countries are developing and emerging markets. This growth is here to stay. South-South tourism is on the rise, and this trend will continue as these countries improve their competitiveness and develop their travel and tourism sectors. While isolationist and protectionist rhetoric is on the front page of the newspapers, the travel and tourism industry, unlike global trade, remains relatively unharmed to date. Governments around the world realize that for the most part, the barriers to travel are not making people and countries safer, but are hindering economic growth, job creation and tolerance between countries. In 2016, destinations worldwide required 58% of the world’s population to obtain a visa prior to departure – a significant improvement from 2008, when 77% of the world’s population was made to apply for a traditional visa. In effect, the great majority (approximately 85%) of countries have reduced, at least partially, the burden of obtaining a tourism visa in the past two years. To continue supporting the expected growth in international travel in the coming decades, we need to continue improving policy frameworks and innovate the way people move across international borders. Today, digital has become a basic requirement to being competitive, even in travel and tourism. Countries not integrating technology and enhancing their connectivity will be left behind. In recent years, we have seen a significant increase in the telecommunications infrastructure across countries. And ICT readiness correlates directly to the amount of value that tourism can generate. However, the meaning of being “ICT ready” continues to evolve rapidly, causing many organizations, companies and countries to spend time rethinking their “service delivery”, integrating constant connectivity into the experience. At the same time, the growing number of connected citizens around the world provides a unique opportunity for customers benefit from the inclusive nature of the travel and tourism industry. In effect, the internet has become a great mechanism to enable locals and travellers to connect directly without relying on intermediaries. Despite growing global awareness on the importance of sustainability, and the fact that real progress has been made on some fronts, many aspects of the natural environment continue to degrade, causing a serious and quantifiable impact on the tourism sector. Data reveals that the environmental strength of a country is directly related to tourism revenue. Although this relationship is complex, and there is no evidence of direct causality, the more pristine the natural environment of a country is, the more tourists are inclined to travel there, and the more they are willing to pay to access well-preserved areas. Consequently, as the natural capital depletes, destinations lose revenue.